Purpose: Use this document as a reference for transferring an employee to a new position in ctcLink. Specify a Reason for the transfer. Change the employee’s position number. Enter the EMPLID in the Search Criteria section and click the Search button. If the fields in the Work Location tab need updating, click the Add a Row button to modify this information. Enter the effective date of the change in the Effective Date field. Select Transfer from the Action drop-down menu. Select Transfer from the Reason drop-down menu. 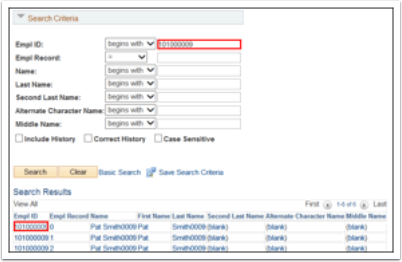 Click the Position Number lookup icon to search for the new position number or enter the new position number. Enter a Comp Rate in the Comp Rate field and Click the Calculate Compensation button to recalculate the compensation of the transferred employee.